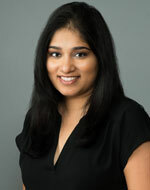 Dr. Ramya Vejella received her training in Nephrology, Hypertension and Interventional Nephrology from Louisiana State University, Shreveport. She also completed Internal Medicine Residency in 2013 from Louisiana State University. Her interests include Chronic Kidney Disease, Glomerulonephritis, Acute Kidney Injury and Interventional Nephrology.